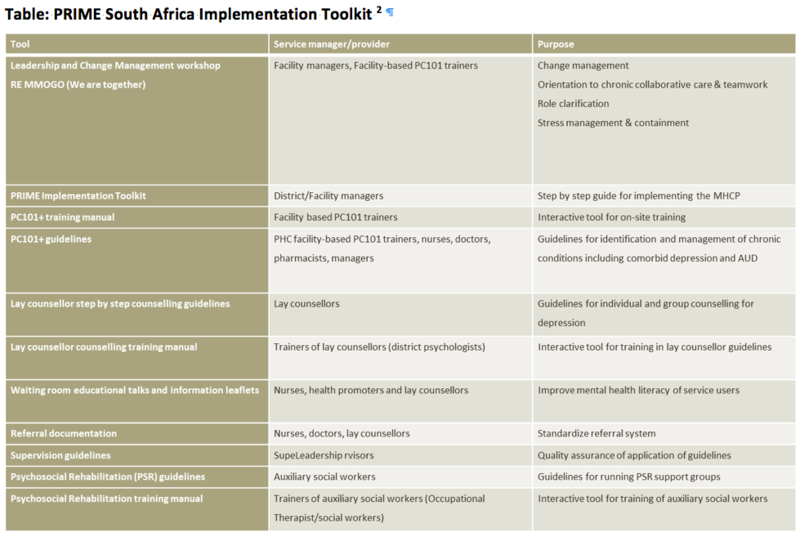 Integrating mental health service delivery into primary health care system in South Africa through a health systems strengthening approach in partnership with researchers, ministries of health and non-governmental organisations. The PRIME mental healthcare plan has been implemented in 4 facilities and their surrounding communities. By January 2015, 94 service providers working in the district had been trained in the provision of mental healthcare. In South Africa we found a significant improvement in detection of depression and alcohol-use disorder and a significant improvement in clinical outcomes for individuals with depression who received care. Health system strengthening in partnership with researchers, Ministries of Health and non-governmental organisations. The program is implementing and evaluating a district level mental health care plan (MHCP) at health organization and facility levels in one district in each country, with a view to scaling up in other districts. In South Africa, the escalating prevalence of chronic illness and its high comorbidity with mental disorders foreground the need for integrating mental health into chronic care at district level. A mixed methods approach to the formative phase was used comprising a situational analysis; Theory of Change (ToC) workshops; qualitative interviews with service managers, service providers, service users and carers of service users; and piloting of the preliminary MHCP in one clinic. A district MHCP which included three collaborative stepped care models for depression, alcohol misuse and schizophrenia was developed as a result of this formative work and piloted. A toolkit was developed to pilot the MHCP. The MHCP was piloted in one Primary Health Care (PHC) facility. Facility-based HIV counsellors and auxiliary social workers deployed by the sub-district mental health society were oriented to mental health care and trained to run psychosocial support groups for patients with depression and schizophrenia respectively. Process evaluations were conducted to assess the barriers and challenges to implementing the MHCP. The MHCP was revised to address these challenges. The MHCP was then rolled out to three additional facilities in the area. A baseline facility detection survey with 12 month follow-up was conducted to assess improvement in detection of depression and alcohol misuse as a result of the intervention. A parallel study to validate the Patient Health Questionnaire 9 (PHQ9), a 9-item scale to screen for depression was also conducted. The results have been published in an article in BMC Psychiatry. Implementation included training of facility managers and refresher training in PC101+ (4 additional mental health modules), training of counsellors for the 4 clinics, change management for nurse led chronic care managers and PHC facility-based professional nurses. A quasi-experimental study was also conducted to assess the clinical, social and economic outcomes of PHC patients diagnosed with depression or psychosis and who receive the PRIME-SA psychosocial intervention at baseline and 3 and 12 month follow-up. Outputs from the implementation included an additional module for lay counsellors to provide adherence counselling, and change management workshop guidelines for nurse led chronic care. DfiD are funding the PRIME consortium £6 million over 6 years. In addition, national Ministries of Health are providing the human resources required to deliver the MHCPs. The budget for PRIME South Africa is US$1,241,396 (£ 803,350). The PRIME mental healthcare plan has been implemented in 3 facilities and their surrounding communities. By January 2015, 94 service providers working in the district had been trained in the provision of mental healthcare. In South Africa we found a significant improvement in detection of depression and AUD and a significant improvement in clinical outcomes for individuals with depression who received care 6. 3. Asmall S, Mahomed OH. (2013) The Integrated Chronic Disease Management Manual. Pretoria: Department of Health. 5. De Silva M, Rathod S, Hanlon C, et al. 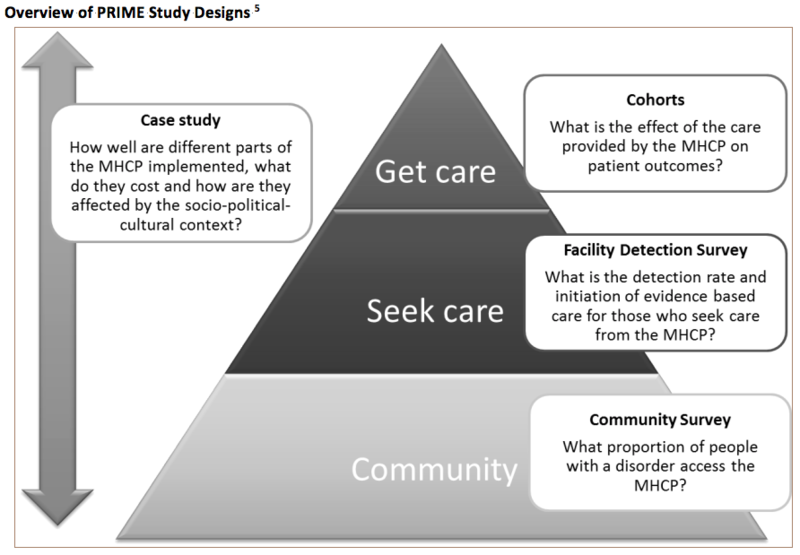 (2015) Evaluation of district mental healthcare plans: the PRIME consortium methodology. British Journal of Psychiatry. doi: 10.1192/bjp.bp.114.153858.